Academy Of Rock (AOR), a music school that strongly believes in holistic learning, provides a conducive environment for students to build and develop their character, inspire creativity and forge lasting relationships through the process of learning. Experience the joy of playing the music of today as well as strumming to the beats of the past, with a structured learning system that is systematic yet tailored to the individual. Be pampered with the choice to pursue your academic aspirations with the leading Rock Music Examination board in the world – Rockschool UK. Get inspired to showcase your talents on the stage or screen. Academy Of Rock Philippines, Inc., the latest addition to the AOR family. 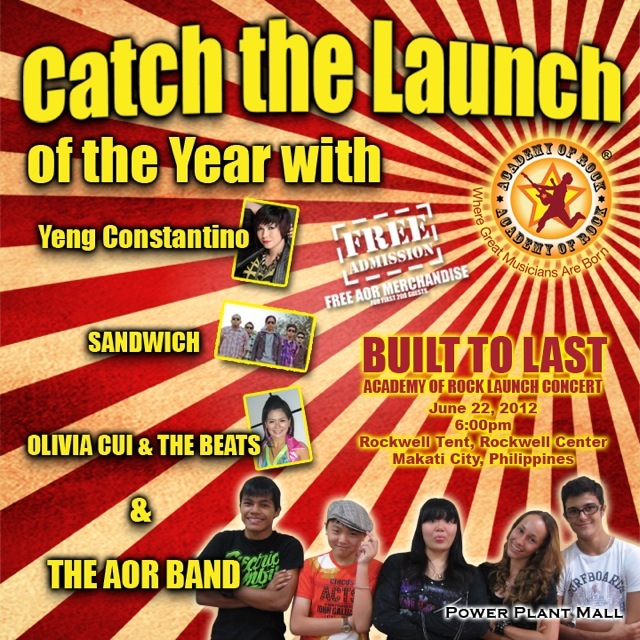 To launch the Academy of Rock Philippines, Inc. is a concert dubbed as "Built to Last" happening at the Rockwell Tent, Rockwell Center, Makati City on June 22, 2012 at 6:00pm. Featured here are Yeng Constantino, Sandwich, Olivia Cui & The Beats, and The AOR Band. Admission is FREE. In the 5 years that they have been in operation, AOR’s successes and achievements have exceeded all expectations. In 2011, they were awarded the Promising SME 500 2012 from Small Medium Business Association (SMBA), Singapore. They distinguish ourselves from many other music institutions by ensuring that their teachers are internationally certified to conduct music lessons. It is part of AOR’s culture to expose students to a diverse range of musical experiences as such that their students are given opportunities to perform at world-class art venues locally as well as abroad. It was a dream come true when they launched their very own retail department with the AOR MUSIC STORE which will market their very own AOR range of instruments. These range of instruments have been carefully selected to cater to the beginners and their quality in construction and finish will prove to be the instrument of choice for any new music prodigy.